“Today, the Otay Water District (“Otay”) filed a lawsuit against the City of San Diego (“City”) in the San Diego Superior Court challenging the amount the City charges Otay for reclaimed water (also known as recycled water). The lawsuit contains a Petition for Writ of Mandate and Complaint for Breach of Contract, among other claims. The lawsuit arises from the City’s November 2015 decision to increase its reclaimed water rate by more than double, from the then current rate of $0.80 per HCF ($350 per acre foot) to $1.73 per HCF ($753 per acre foot), effective Jan. 1, 2016. Otay had objected to the City’s rate increase, providing both written and oral testimony during the City’s rate setting process. Otay buys reclaimed water from the City as a wholesale customer under a 2003 Agreement for the provision of reclaimed water from the City’s South Bay Water Reclamation Plant. The City’s new reclaimed water rate is a unitary rate, which includes costs for reclaimed water service from both of the City’s reclaimed water facilities, the North City Water Reclamation Plant and the South Bay Water Reclamation Plant. Otay does not and cannot receive any reclaimed water from the North City plant, therefore it contends that the City breached its contract with Otay and violated California law by requiring Otay to pay for costs of the North City plant and its related reclaimed water service facilities. The lawsuit alleges that the City’s new reclaimed water rate violates the 2003 Agreement as well as the California Constitution (Propositions 13, 218, and 26), statute, and common law. The City has also breached the Agreement by unreasonably interfering with and restricting Otay’s ability to increase sales of its reclaimed water¹ and by violating the Agreement’s reclaimed water requirements. As a result of the City’s actions, Otay will suffer damages in excess of $16 million. Otay has overpaid the City since the new rate became effective on Jan. 1, 2016 and it is seeking reimbursement for its overpayment. Otay has tried to resolve its dispute with the City, but the City has not been responsive. The City will continue to overcharge Otay until a court orders it to comply with its legal duties. It is our responsibility to our ratepayers to hold the City accountable for its failure to establish a rate that is fair, reasonable, and proportionate to the cost of service to its reclaimed water customers. The City owns two plants for the production of reclaimed water – the North City Plant and the South Bay Plant. Each plant has an independent distribution system and is not connected to the other. The North City Plant has an extensive distribution system that includes approximately 93 miles of pipelines and related water delivery facilities. The City sells 99.7 percent of the reclaimed water produced at the South Bay Plant to Otay. The City delivers the reclaimed water to Otay at a meter, which is less than a mile from the South Bay Plant. Thereafter the reclaimed water is transported more than five miles via pipelines that are owned and operated by Otay. 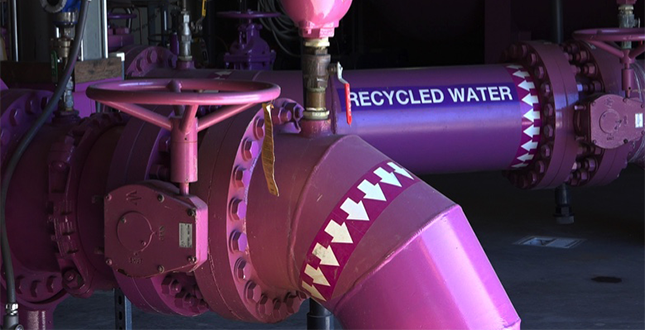 The capital and operational costs of the North City’s extensive recycled water service system far exceed the cost of the City’s facilities for delivering reclaimed water to Otay from the South Bay Plant. The City is using Otay’s payments to subsidize the cost of providing recycled water service to customers of the North City Plant. Because it does not and cannot receive any reclaimed water from the North City Plant, Otay is being charged for a service that it cannot and does not receive. Under the 2003 Agreement and the California Constitution and other laws, the City cannot charge Otay any more than the reasonable cost of providing reclaimed water from the South Bay Plant to Otay. Instead of adopting the new rate, the City should have adopted a separate rate based on the cost for reclaimed water service in its Northern Service Area and a different rate based on the cost for reclaimed water service in its Southern Service Area. This option is known as a zonal rate structure. Under a zonal rate structure, the costs associated with the North City system would be borne by customers who benefit from that system and the costs associated with the South Bay system would be borne by customers who benefit from the South Bay system. Otay advocated for a zonal rate structure during the City’s rate setting process. The City’s own rate consultant concluded that a zonal rate structure more closely aligned the rate charged to the cost of operating each individual reclaimed water facility and its respective distribution system. In addition, the City has been unjustly enriched at Otay’s expense. The City has failed to properly expend or provide an accounting of Otay’s capacity reservation fee of $3.6 million for reserved capacity in the South Bay plant and its transmission facilities. The City has refused to provide an accounting of its use of those fees. The City has also used Otay’s facilities in excess of the Agreement’s provisions without paying for that use. Otay believes further that the City, by its conduct, has breached the implied covenant of good faith and fair dealing, which imposes on each party to a contract to refrain from conduct that will deprive the other of the benefits of the agreement. ¹This interference is particularly egregious because the Agreement has a “take or pay” (minimum purchase) requirement and the City is unreasonably preventing the District from expanding service of reclaimed water up to the take or pay amount.